The O2 Arena plays host to yet another blockbuster night of boxing featuring Anthony Joshua vs Dillian Whyte, Chris Eubank Jr vs Spike O'Sullivan, Tony Bellew vs Mateusz Masternak plus appearances from Luke Campbell, Kevin Mitchell and Dereck Chisora. Bad Intentions, taking place on December 12, is Matchroom Boxing's second pay-per-view of the year and albeit a very controversial and questionable one, it has potential to be one of the best British boxing events in the year. Ranging from an explosive British title scrap between two young, ambitious heavyweights, a cracking domestic battle to propel to world level and dangerous, must win fights for former world title challengers looking to climb the ladder of their respective divisions. Olympic-gold medalist Anthony Joshua (14-0 14 KO's) and fellow unbeaten heavyweight Dillian Whyte (16-0, 13 KO's) have been on a collision course since spring. 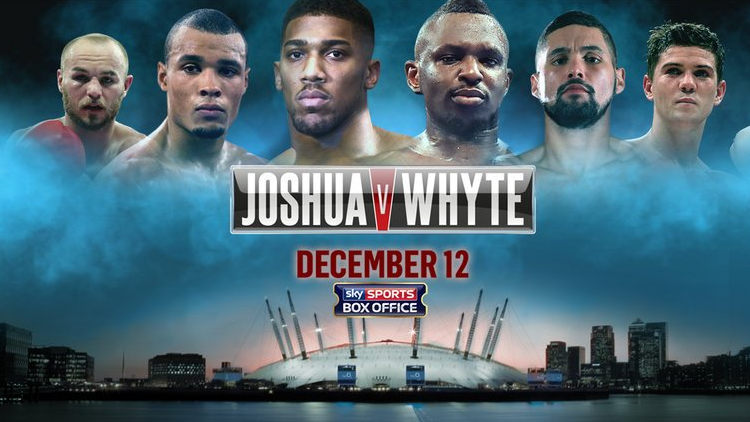 To state they dislike eachother would be a huge understatement - Whyte has played the trash-talking villain while Joshua, calm and collected, has stayed in his own zone as he prepares to avenge from his loss from the amateurs. The Londoner, 26, most recently knocked out Gary Cornish in 90 seconds in his biggest fight to date, while Dillian Whyte has also racked up impressive stoppage victories ahead of the huge heavyweight title scrap that commences on December 12. The general consensus has remained since the fight was made is that though Whyte is undefeated and brings plenty of ambition to the table, this will not last long due to the aura of invincibility Joshua seems to portray. Having not been taken past three rounds before, Joshua predicted Whyte will be the first man to do it. That, to me, is an attempt at justifying a British title fight being staged as a pay-per-view main event and actually persuading fans this will not be a mismatch. Though it's tipped to be 'explosive' - it will also be one-sided. Dillian Whyte has flaws in his boxing; he can be very slow, sluggish and often miss the target with wild shots. Joshua, carrying enormous power and lightening speed, shouldn't be prevented from executing a brutal performance in the ring. Although I expect Joshua to win comfortably, he could absorb big shots from Whyte which is being richly craved by the fans. Regarded as the 'next Lennox Lewis' - Joshua has a brilliant opportunity to once again showcase his potential in front of 20,000 fans at the O2 Arena on pay-per-view. Bidded as the potential fight of the night - Chris Eubank Jr (20-1, 15 KO's) and Spike O'Sullivan (22-1, 15 KO's) will put their heated feud to rest, with the winner securing a shot at the WBA middleweight title currently held by Daniel Jacobs. This is a very interesting fight because both Eubank and O'Sullivan have suffered the same loss and are now in the same position - on the verge of a world title shot. In 2013, 'Spike' was outclassed by Billy Joe Saunders, who then a year later, defeated Chris Eubank Jr - taking the undefeated records from both fighters. Eubank Jr, son of the prolific ex-world champion Chris, brings crispness, speed and accuracy to the fight while O'Sullivan's main attributes lies in the category of one-punch knockout power. Eubank Jr is rightfully the favourite testament to his sheer ability and possibly, because he has a legendary and famous name. O'Sullivan, emanating from Ireland, is a proven warrior who is willing to go to the trenches in order to obtain victory. The 31-year old has vowed to stop his middleweight rival and he potentially has a case too; winning his last five fights by knockout including a first-round decimation of the durable Anthony Fitzgerald. Chris Eubank Jr took far too long to seize traction and success against Billy Joe Saunders and if he underestimates O'Sullivan, which seems a fair possibility, the determined Irishman could pull off shock of the night. O'Sullivan grinds his opponents down on the inside; at his best when landing fast, powerful combinations. Footwork is key against this animal. Eubank's footwork is average, which is obviously a huge disadvantage. If Spike O'Sullivan can drag Eubank into a dirty brawl, he can certainly win. While there is a possibility Eubank could box at long range with his strong jab and crisp accuracy, my head says O'Sullivan and his team have the perfect gameplan to emerge victorious. After outpointing Nathan Cleverly in his hometown of Liverpool last November, the career of Tony Bellew (25-2, 16 KO's) has taken a sabbatical since featuring in the new 'Creed' film. But now, after stringing together two consecutive knockout victories, The Bomber is back and has a clear path to a destined world title shot at cruiserweight. The man standing in his way - Mateusz Masternak. The 28-year Pole (36-3, 25 KO's) is an ideal measuring stick for Tony Bellew's progress in the division prior to a potential world title fight next year. Showcasing his toughness and ability to absorb excessive punishment, Masternak took WBC champion and destructive puncher Grigory Drozd 11 rounds. 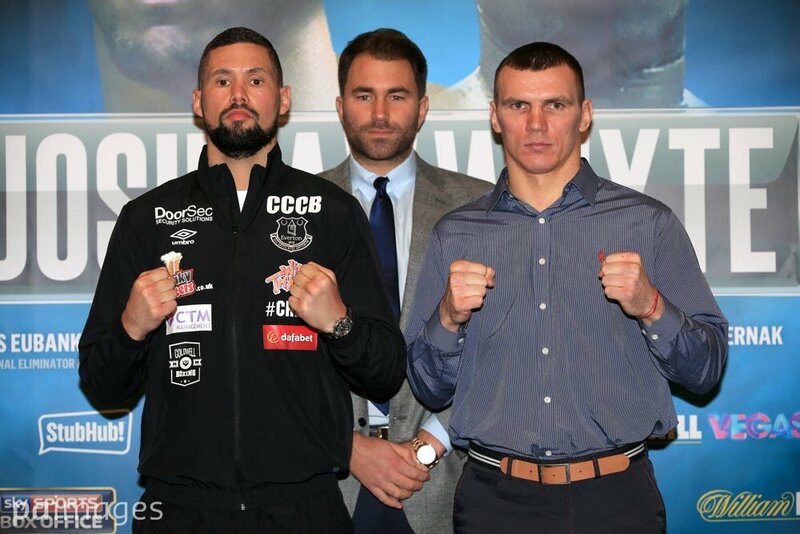 The favourite Bellew weighed in at 14st 3lbs while Masternak tipped the scales at a slightly lighter weight of 14st 2lbs. Liverpudlian Bellew will have an advantage in wight and should increase that during re-grueling before the fight, and despite Masternak having a reputation as a tough fighter who can take anyone to the trenches, my money is on Bellew to grind the Pole down and stop him late. This truly is a must-win fight for The Bomber; he unluckily failed to capture world title glory at light-heavyweight and cruiserweight could is his final shot at redemption. After looking arguably lackluster before in this division, he also evidently carries more power. However, my only worry for Bellew is stamina. He must execute a 12-round plan; not making a potentially costly mistake of looking to stop Masternak early. He is a tough, durable fighter who, if he is going to be knocked out, it will most definitely occur late. Bellew pouring on the pressure and losing energy as the fight progresses could be result in disaster; shades of that happened against Nathan Cleverly but luckily, Cleverly was even more gassed himself. Providing that Bellew gradually wears Masternak down without losing too much stamina, a late stoppage is definitely on the cards here. Masternak, however, as previously said, is very durable and capable of taking a big puncher in Bellew the distance. 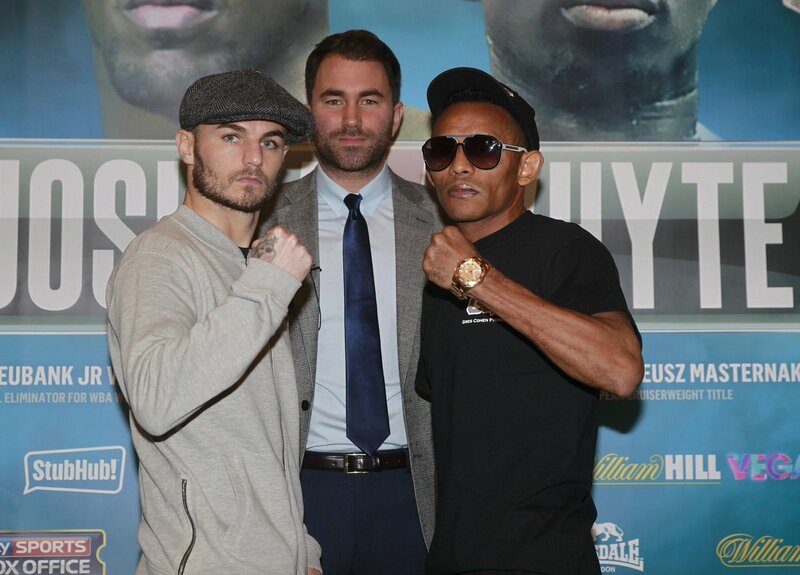 Tony Bellew isn't the only boxer in a must-win fight, Kevin Mitchell is. After heroically losing out to Jorge Linares in May, the 31-year old has been climbing his way back up the ladder to a potential fourth world title shot but undefeated knockout artist Ismael Barroso stands in his way. Mitchell (39-3, 29 KO's) and Barroso (18-0, 17 KO's), both carrying high ambitions, weighed in at 134.5lbs before their intriguing lightweight clash on this blockbuster pay-per-view card. Kevin Mitchell, a former world title challenger, has lost and been stopped three times in his career against Jorge Linares, Ricky Burns and Michael Katsidis. Unfortunately for Mitchell, he is going toe-to-toe with a devastating knockout puncher in Barroso, who albeit still hasn't been proven as an elite fighter, but is certainly capable of pulling off the upset. Mitchell, a tough fighter who carries enormous heart, has only been stopped from accumulations of punches and not one-punch knockouts. Barroso, well known for his devastating punching power that has previously finished fights in an instant, would be making a mistake trying to stop Mitchell with one huge shot. It will take more than that, and if Barroso is to emerge victorious, he must use his piercing jab effectively and obtain bursts of success. As for Mitchell, taking the temptations gamble of trading with Barroso could possibly end in disaster. Mitchell has underrated boxing skills that can be used to his advantage. If he boxes at long range with a crisp, accurate jab then he can grow into the fight as it progresses. As Barroso tires, Mitchell should unravel his guard and unload with high-risk shots. Ismael Barroso is a talented fighter with immense power that will be a lingering to Kevin Mitchell all night, but he hasn't faced anyone on Mitchell's level. This could be a tough night for the Dagenham fighter, but one I expect him to emerge victorious in. 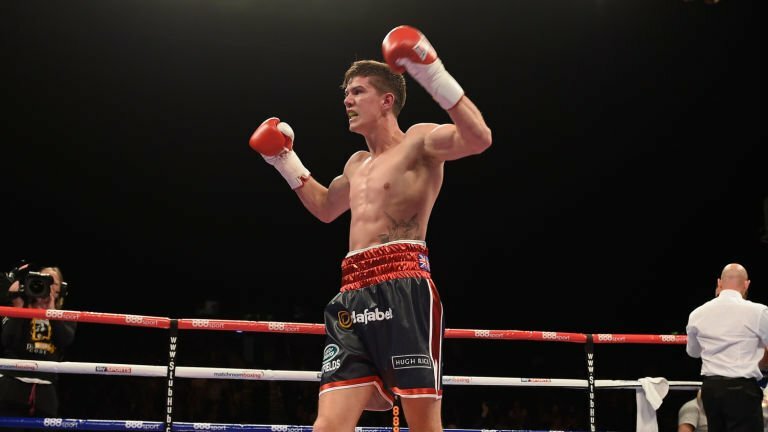 After an impressive knockout victory over Tommy Coyle in August, Olympic-gold medallist Luke Campbell (12-0, 10 KO's) has the opportunity to move closer to a world title shot with victory over Yvan Mendy (32-4, 16 KO's), a fighter with plenty of ambition but evident lack of skill to cause a massive upset. Campbell, 28, has a crisp jab, lightening speed and dazzling foot which will be enough to cause Mendy serious problems early in the fight. I do believe this is a step down for Campbell, though, and his career is being stranded by by Eddie Hearn who is failing to bring him along bit by bit in bigger fights. There are positives, however. Campbell has a great chance to claim another scalp on pay-per-view exposure before a possible IBF eliminator against the undefeated Richard Commey next year. Subsequently, Mendy has little to offer in this fight and Campbell's canny ability to end fights whenever necessary could be the deciding factor. Mendy, can however, bring durability to this fight having taken world champion Viktor Postol the distance before. He has never been stopped and could potentially take Campbell into the later rounds, but may come unstuck when Campbell eventually piles the pressure on with his powerful and speedy combinations. 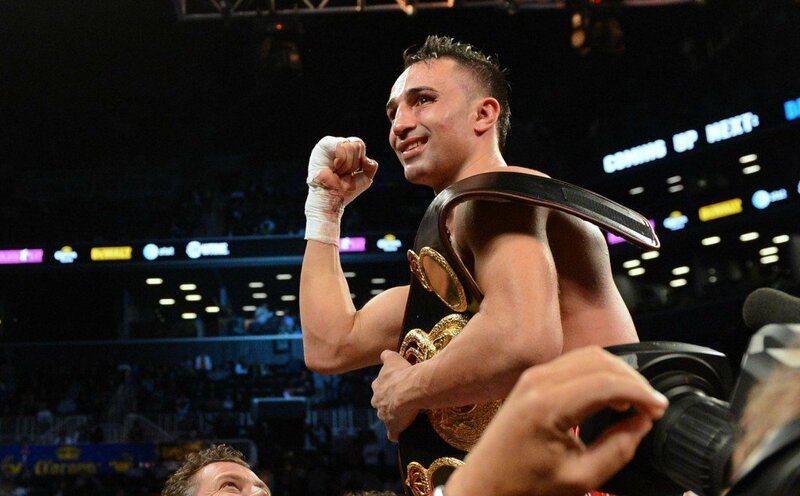 Paulie Malignaggi (34-7, 7 KO's) continues to upset the odds in his career. Many thought he was finished and on the verge of retirement after a knockout defeat to Danny Garcia, but the Brooklyn-native still feels there is plenty left in the tank and will look to prove why against Antonio Moscatiello (20-2, 14 KO's). Malignaggi was initially scheduled to challenge European welterweight champion Gianluca Branco but since he pulled out, Moscatiello has stepped in to take his place. The Italian, having lost twice, is not expected to cause overwhelming favourite Malignaggi problems. The only advantage Moscatiello has is in the power category. Malignaggi doesn't punch hard at all, so he will be able to take calculated risks and look to create openings. That, however, is easy said than done due to Malignaggi's jab and move style. He is illusive and Moscatiello will find it difficult to land a succession of punches. While Malignaggi isn't a big puncher with only 7 knockouts in his 34 fights, expect him to outbox a game Moscatiello to the final bell. Expected to be one of the first fights on the card, Dereck Chisora (23-5, 15 KO's) steps into the ring for a second time in two weeks against journeyman Jakov Gospic (16-13, 12 KO's). After recently signing with Team Sauerland and claiming a fifth round stoppage win last weekend, this is an excellent chance for Chisora to look impressive on pay-per-view exposure. This isn't an important fight so to say considering he is replacing the injured Josh Warrington, but Chisora seized the opportunity and took it. His opponent Jakov Gospic, emanating from Croatia, will simply look to survive the duration of the eight round fight. Having been knocked out by the likes of Gary Cornish, Erkan Teper and even Matt Skelton, this is definitely a fight Chisora can add a knockout to his record. The Londoner was all smiles at the weigh in, snapping pictures of the crowd and even the ring-girl, and will look to continue that with an emphatic victory at The 02 Arena in London. This is a blockbuster night of action and one that will propel British boxing onto another level of stardom. Enjoy it! Have something to add? Share in the comments below.